Richard Bland College of William & Mary is dedicated to ensuring that students who begin their work at other accredited institutions and programs can transfer legitimate and equivalent coursework to RBC. A minimum of thirty credit hours must be completed at Richard Bland College toward an Associate of Arts or Associate of Science Degree. 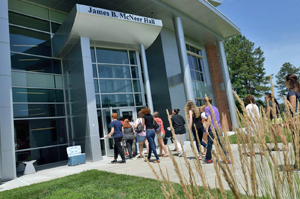 Richard Bland College of William & Mary awards college credit to students who score satisfactorily on the College Level Examination Program (CLEP). These credits are not used in the computation of the student’s RBC grade point average. Generally, a student may not receive credit by examination for a course they failed or for a basic course when college credits have been earned at a more advanced level. Credits awarded will not exceed those awarded by CLEP. Students seeking locations for taking CLEP tests may contact the RBC Registrar’s Office at 804-862-6185. The full list of CLEP credits accepted by RBC is published in the current College Catalog. Richard Bland College of William & Mary recognizes the Advanced Placement Tests of the College Entrance Examination Board as a legitimate means of acquiring college credit. Students must furnish the College registrar with official transcripts from the Advanced Placement Program for consideration. Credit will be awarded on the basis of recommendations suggested by the American Council on Education (ACE). These hours are not used in the computation of the student’s RBC grade point average. Richard Bland College of William & Mary is a member of the Service Members’ Opportunity Colleges (SOC), a consortium of over 1,500 colleges and universities that provide college-level educational opportunities for service members and their families. As a SOC member, RBC recognizes the GED high school equivalency certificate/diploma; recognizes learning gained from specialized training and experiences in the military services; and establishes competency by nationally recognized means such as standardized tests. Official “Registry Transcripts” received from various United States military branches are evaluated using the “ACE Credit Recommendations” on each transcript.